U.S. 30 extends from U.S. 101 in Astoria, Oregon, east to Atlantic Avenue in Atlantic City, New Jersey. 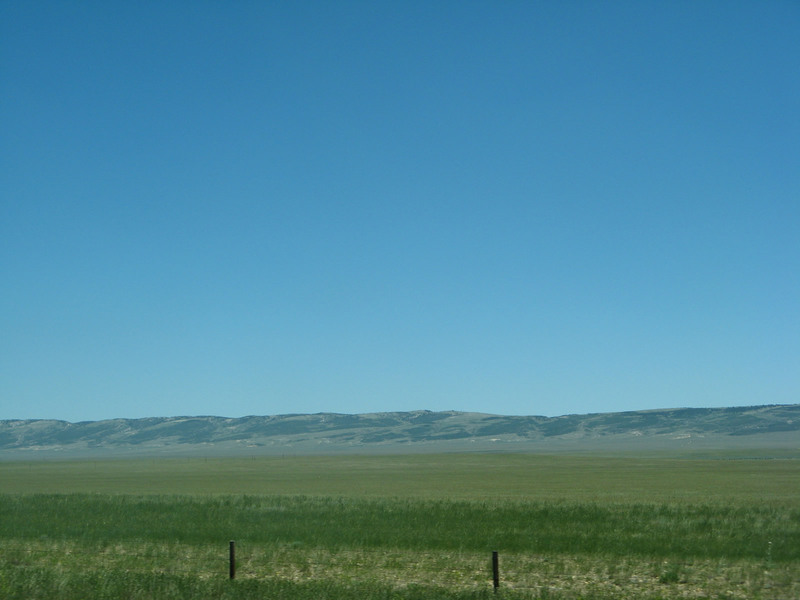 It passes through the southern tier of the Equality State, leaving Idaho and entering Wyoming at Border Junction. From there, U.S. 30 briefly turns south along with Wyoming 89 to near Sage, then proceeds east-southeast through Kemmerer to Granger. At Granger Junction, U.S. 30 joins Interstate 80 (at Exit 66) and Lincoln Highway to turn east for its journey to serve Green River, Rock Springs, Wamsutter, Rawlins, and Sinclair before departing the freeway at Walcott Junction. U.S. 30 and U.S. 287 travel along the Lincoln Highway and parallel the Union Pacific Railroad from Walcott Junction to Hanna, Medicine Bow, Rock River, and Bosler. 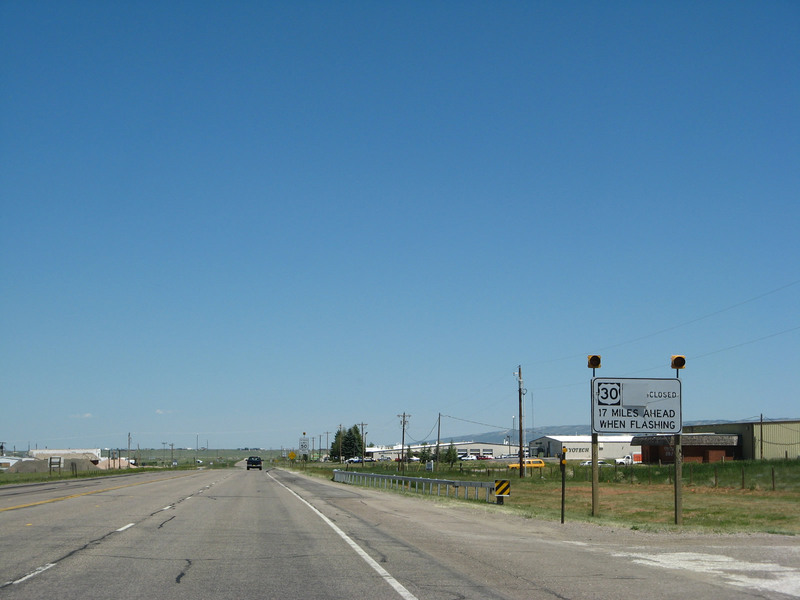 U.S. 30-287 travel nearly due south upon entering the city of Laramie, where U.S. 30 again turns east through Laramie and rejoins Interstate 80 at the east end of town. 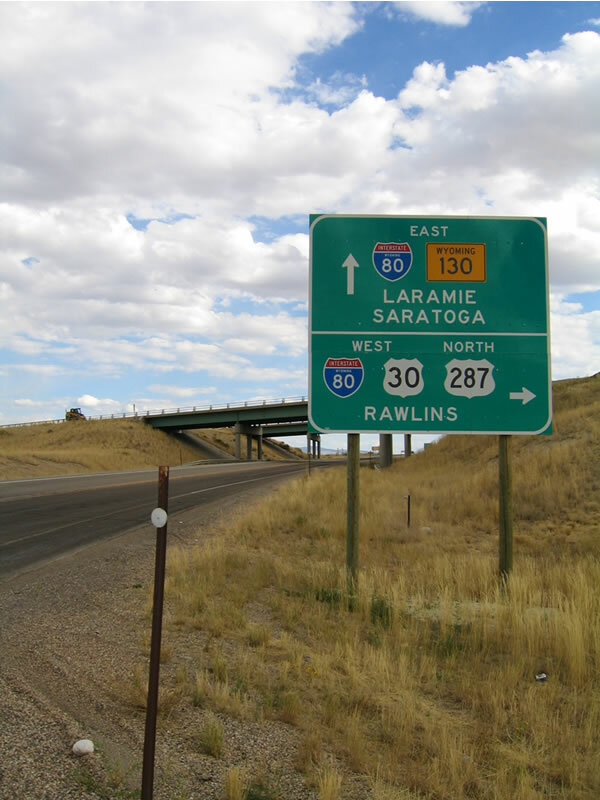 Interstate 80 and U.S. 30 proceed east through the Laramie Mountains to the highest point on transcontinental Interstate 80 at Sherman Hill, then descend on Interstate 80 via the Gangplank into the state capital of Cheyenne. U.S. 30 follows Business 80 along Lincolnway into Downtown Cheyenne, and it eventually reconnects again with Interstate 80 at Archer (Exit 352). 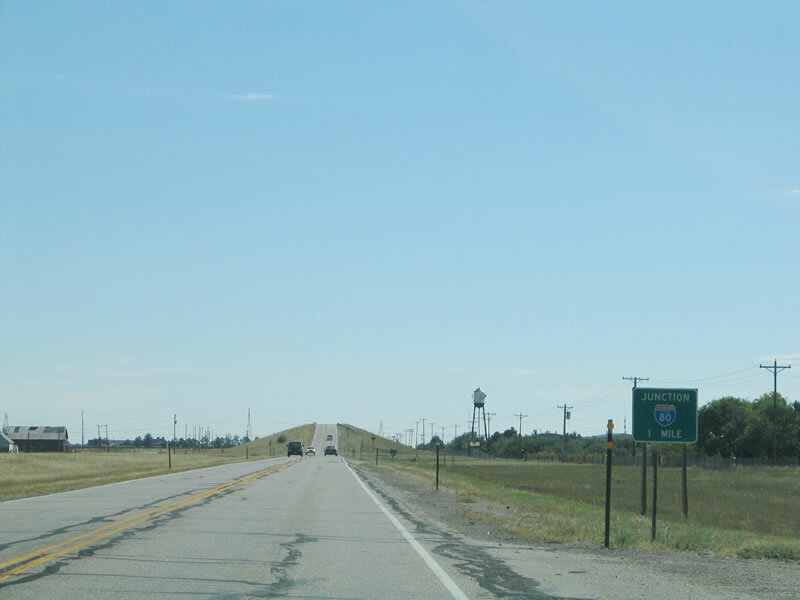 From Cheyenne east to Pine Bluffs, Interstate 80 and U.S. 30 travel together and separate near the Nebraska State Line. 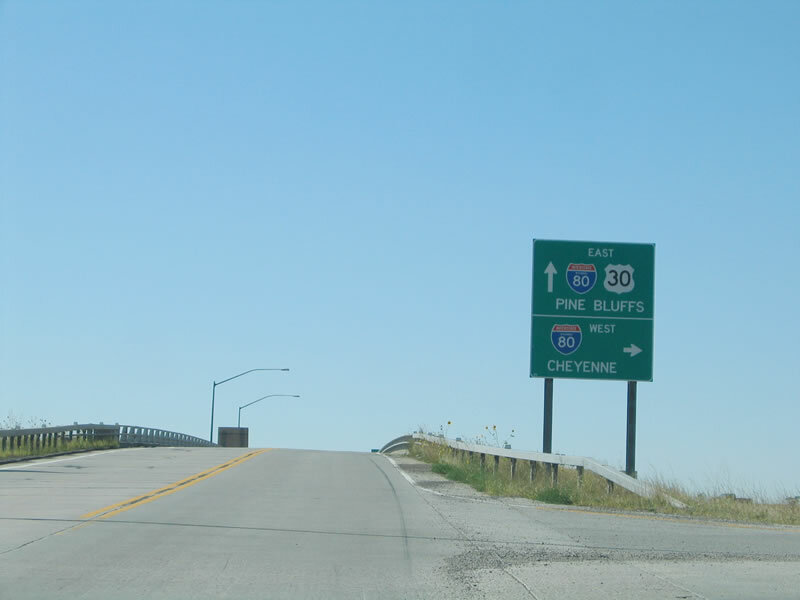 At Pine Bluffs, U.S. 30 stays on the Interstate to depart the freeway at Exit 1 in Nebraska (a business route follows the old alignment through Pine Bluffs). U.S. 30 has five business routes, almost all of them in conjunction with Interstate 80. 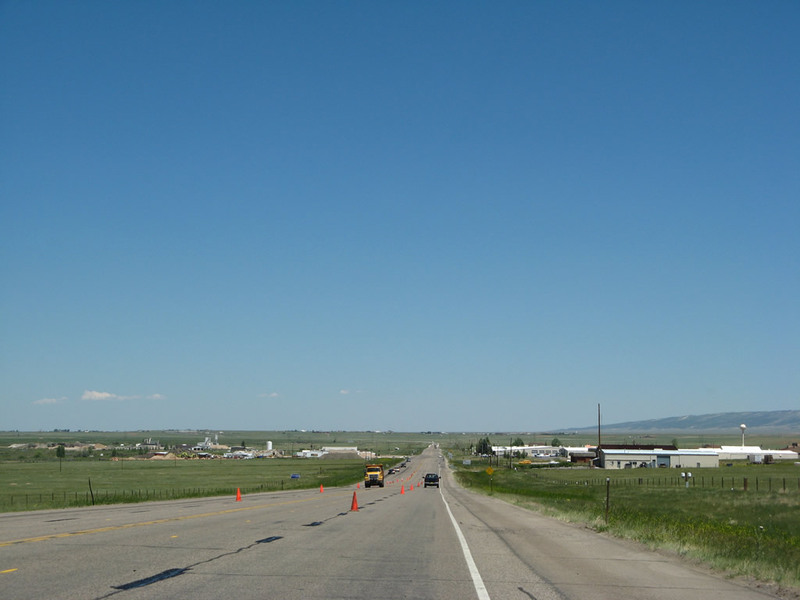 In Kemmerer and Diamondville, U.S. 30 splits into a business/bypass configuration. Business U.S. 30 follows the original city route of U.S. 30, while a two-lane "Super 2" bypass provides relief for through U.S. 30 traffic. Some signs call the route through Kemmerer (via Pine Avenue and Central Avenue) part of mainline U.S. 30, while other signs designate it as Business U.S. 30. A portion of the business route is cosigned along with U.S. 189. Meanwhile, some signs designate the Super Two bypass route as Bypass U.S. 30, while others imply the bypass is mainline U.S. 30. In Green River, Business U.S. 30 is cosigned along with Business Loop I-80 and To Wyoming 530 along Flaming Gorge Way. In Rock Springs, Business U.S. 30 is cosigned along with Business Loop I-80 (also partially signed as To Wyoming 430) along Dewar Drive to the west and Pilot Butte Avenue to the east. In Rawlins, Business U.S. 30 is cosigned along with Business Loop I-80 and Wyoming 789 along Spruce Street and along with Business Loop I-80 and U.S. 287 along Cedar Street. 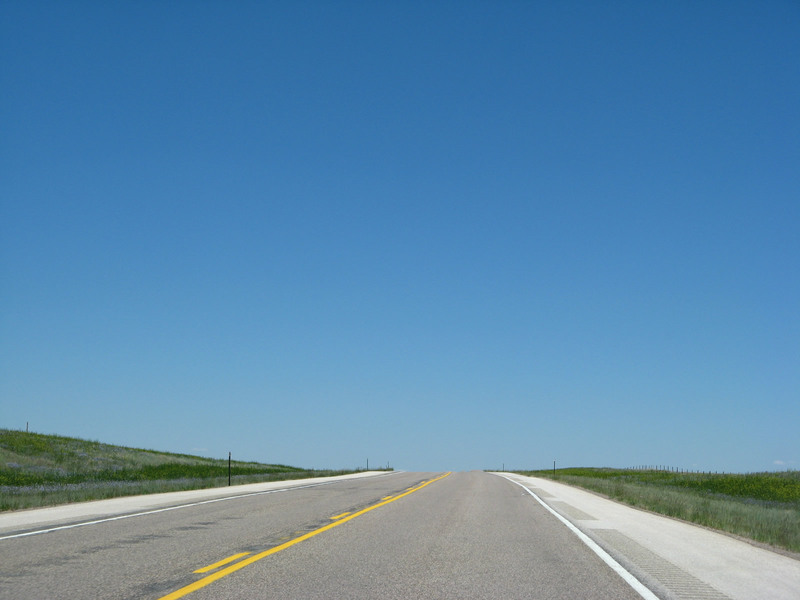 In Pine Bluffs, the U.S. 30 business route is cosigned along with Business Loop I-80 within the state of Wyoming but is signed as regular U.S. 30 once within Nebraska. Currently, signage inconsistently marks the Wyoming portion of the business route as regular U.S. 30 or as Business U.S. 30 along Lincoln Highway. 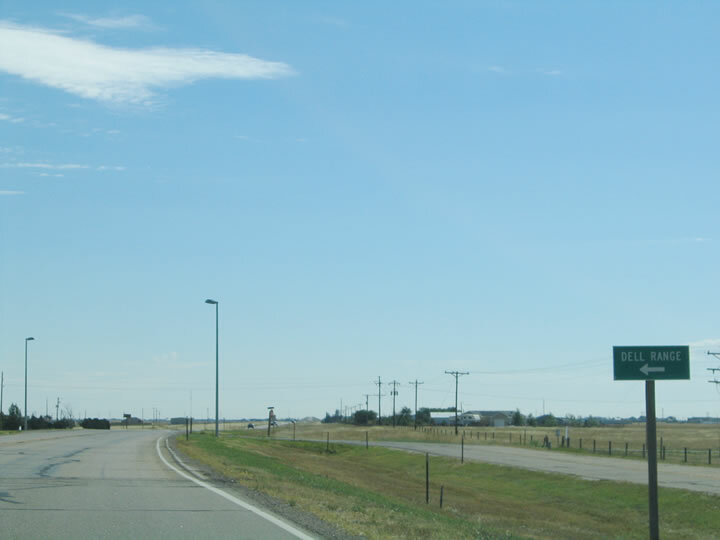 Business Loop I-80 is fully signed in Wyoming but is currently mostly unsigned in Nebraska. In Cheyenne, there used to be signs posted for Business U.S. 30 along Business Loop I-80 and U.S. 30/Lincolnway. However, this appears to have been an error since there was otherwise no mainline U.S. 30. On the mainline Interstate 80, there are no U.S. 30 signs between the western business loop exit and Wyoming 212 (College Avenue) interchange. As you approach Cheyenne from the west, older signs used to state "Business Loop I-80 and Business U.S. 30, Lincolnway." In the 1990s, when exiting onto Lincolnway east, there were Business Loop I-80 and Business U.S. 30 signs. This was rationalized and clarified in the 2000s, and it's pretty clear now that mainline U.S. 30 travels directly through Cheyenne. 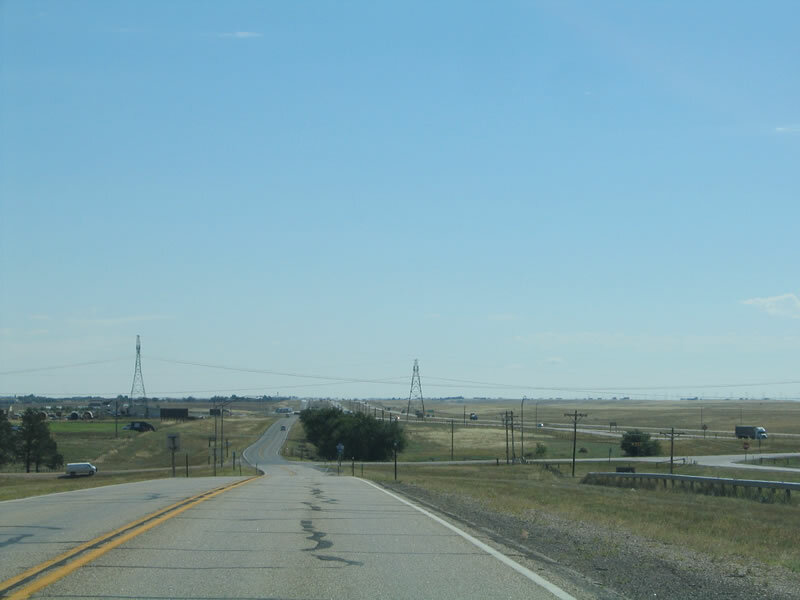 Portions of Nationway may have been a former alignment of the only instance of an Alternate U.S. 30 in Wyoming, but that route is long gone. Certain maps from the 1970s indicated an "Alternate U.S. 30" along Nationway, but signs indicating this route were gone by the 1980s. This may have tied into the timeline to construct the Interstate 80 marginal route south of Downtown Cheyenne. 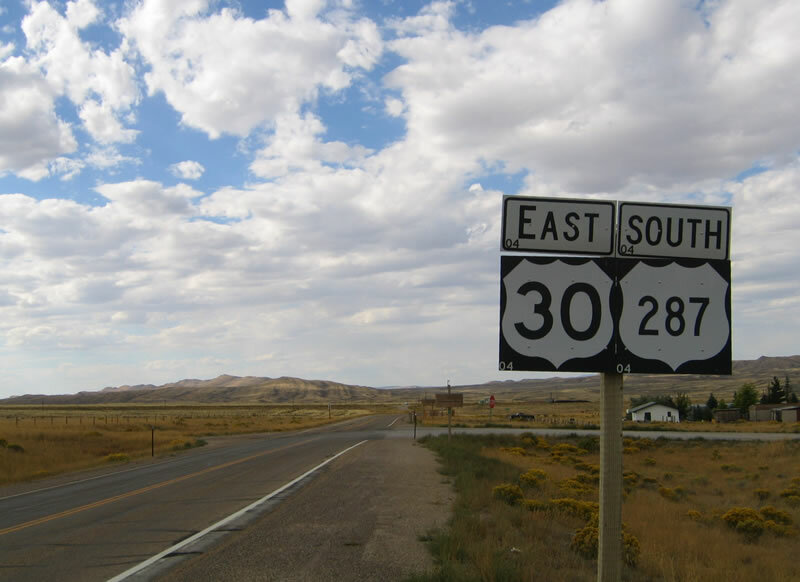 U.S. 30 used to have a split route (U.S. 30N and U.S. 30S) defined in southwestern Wyoming until 1972. The split occurred in Granger (near Little America) and continued west to Rupert, Idaho. U.S. 30S followed the present Interstate 80 course southwest to Echo Canyon, then northwest via Interstate 84 to Tremonton and Park Valley. U.S. 30N followed the present U.S. 30 course northwest to Kemmerer, Soda Springs, and Pocatello; then it turned due west to American Falls and Rupert via Interstate 86 and U.S. 30. 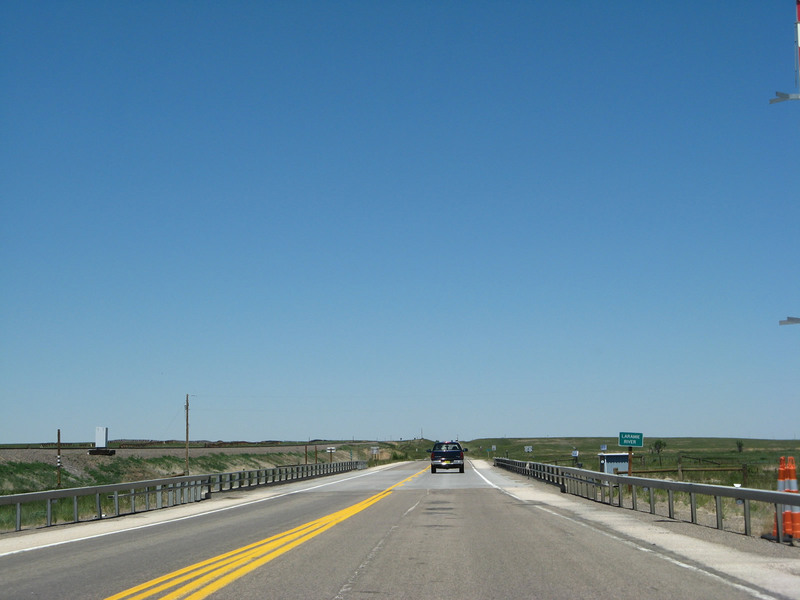 The split route was decommissioned with the construction and completion of Interstate 80 in southwestern Wyoming; this made U.S. 30S superfluous. 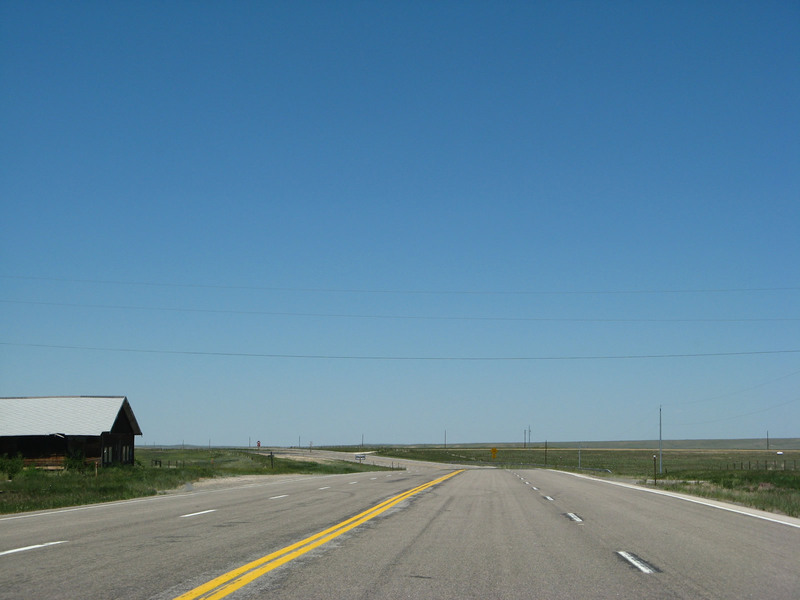 Historically, the only other Wyoming U.S. route ever to have such a split definition was U.S. 87 prior to 1936. 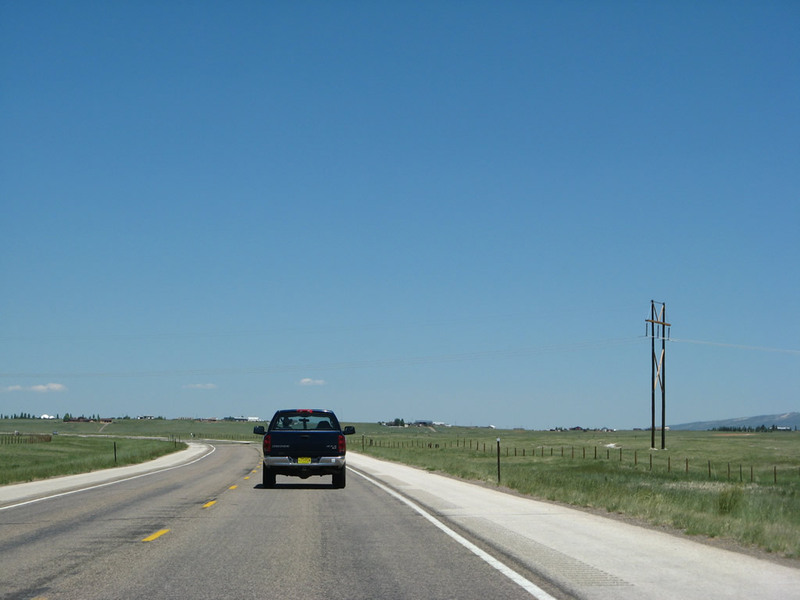 U.S. 30 has had as many as five state primary routes (as indicated by its numbering): Wyoming 130, 230, 330, 430, and 530. Most of these routes are still around, but Wyoming 330 was decommissioned in favor of Wyoming 789 when that route was created across the state in the 1950s. Wyoming 330's number was reused in Sheridan County as a secondary state route (similar to the fate of Wyoming 316 and Wyoming 320, both of which have been recycled). The other four routes (130, 230, 430, and 530) all remain in existence today and either directly or indirectly connect to U.S. 30 itself. 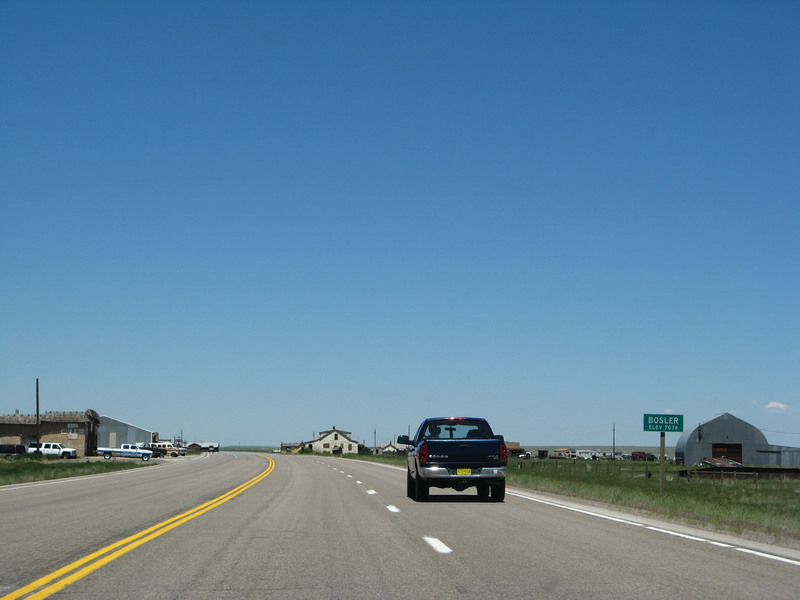 U.S. 30 follows the Lincoln Highway between Granger, Wyoming, and Philadelphia, Pennsylvania. West of Granger, the Lincoln Highway continues along the Interstate 80 corridor to San Francisco, California. 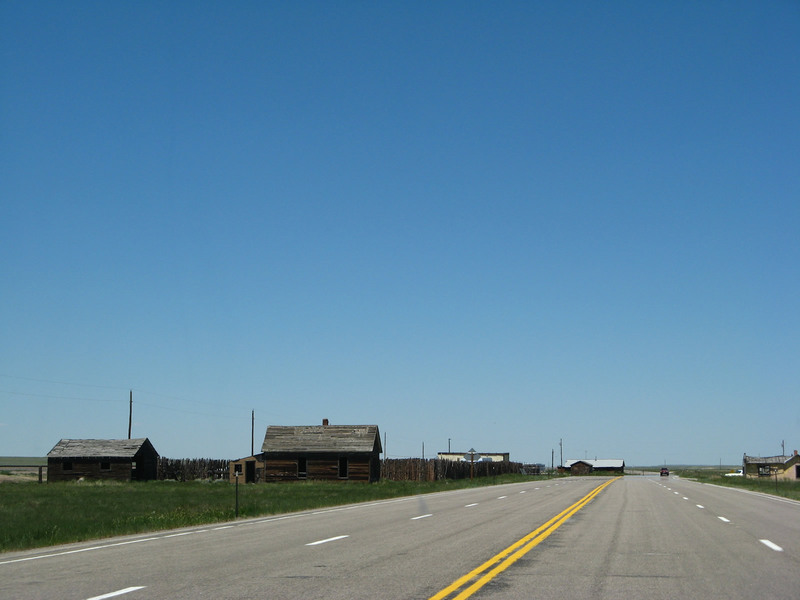 In 1926, U.S. 30 and U.S. 30S followed the historic Lincoln Highway for its entire route through Wyoming. Click here for more on the Lincoln Highway. There was much debate in the mid-1920s regarding the future routing of U.S. 30. Plans originally called for U.S. 20 to run from Astoria, Oregon, to Yellowstone National Park, Wyoming, via the modern-day U.S. 30. This routing was in the 1926 Rand McNally Road Atlas. At that time, U.S. 30 was planned to end in Salt Lake City, Utah. However, Oregon and Idaho balked at the plan. Prior to the final draft of the U.S.-numbered highway system, there were several fights that erupted over which state would get which numbers. Since route designations that end in zero or one were considered to be the "major" or "through" routes, states competed for them in the mid-1920s. 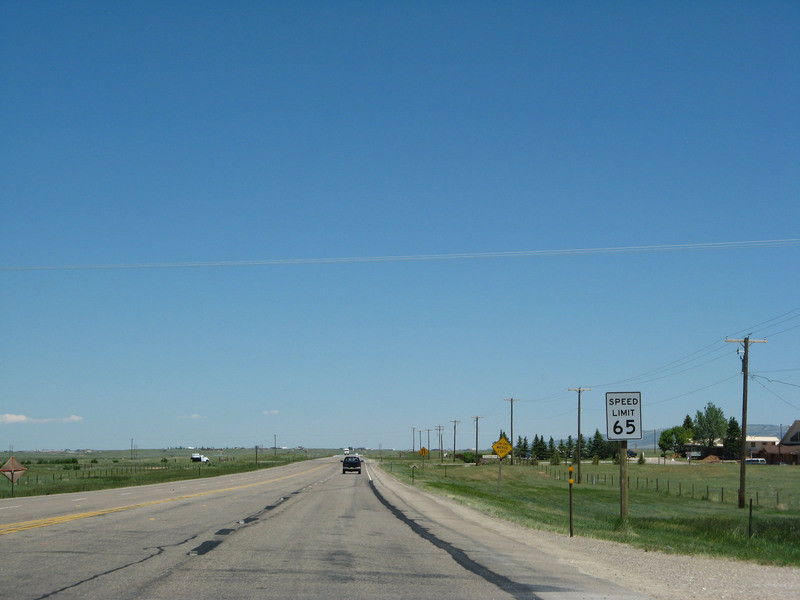 One famous example was U.S. 66, the Mother Road. In 1925 and 1926, U.S. 66 was first planned as U.S. 60, was later planned as U.S. 62, and was finally named U.S. 66 as a compromise among several states. The 1926 Rand McNally Road Atlas shows U.S. 66 as U.S. 60, which was corrected for the 1927 edition of the atlas. Advocates of the route preferred the 66 designation over 62 when it became clear that 60 would be used for a transcontinental route originating in Virginia and traveling west from there. A similar fight erupted among the states of Wyoming, Utah, and Idaho. According to the Spring 1997 AASHTO Quarterly, the numbering of the route from Astoria, Oregon, to Yellowstone National Park, Wyoming, was under intense debate. Wyoming, Utah, Idaho, and Oregon could not agree on whether to call this route U.S. 20 or U.S. 30. All of this discussion was ongoing when the aforementioned 1926 Rand McNally atlas was being printed. That atlas showed U.S. 20 extending west from Yellowstone National Park to Astoria, Oregon. The route went from Yellowstone to Idaho Falls and Pocatello, where the route continued to Astoria via the general route of what is now U.S. 30. At that time, U.S. 30 had a truncated western terminus at its junction with U.S. 40 about 25 miles east of Salt Lake City, Utah. In 1926, what is now Interstate 84 was planned as U.S. 630, and it was planned to connect U.S. 30 at Echo with U.S. 91 in Ogden. What is now U.S. 30 in Idaho and Wyoming was planned as U.S. 530 in the 1926 atlas. U.S. 530, at that time, connected U.S. 30 at Granger, Wyoming, with U.S. 91 near Pocatello, Idaho. Idaho and Oregon objected to the transcontinental U.S. 20 designation because the route passed through Yellowstone National Park. With its high elevation and topography, Yellowstone presented several problems to both states: Yellowstone required an admittance fee (at that time it cost $7.50 to enter the park), the route via the Grand Loop Road was closed in winter, and the route was not the most direct route to the east. Both states maintained that by extending U.S. 30 from Granger, Wyoming, to Astoria, Oregon, via Boise and Portland, Oregon and Idaho would get a free, all-weather, two-digit U.S. route that was a multiple of 10. Utah objected to losing U.S. 30, even though it already had U.S. 40 and U.S. 50 within its state. The route numbering committee compromised and split U.S. 30 into north and south branches between Granger, Wyoming, and Burley, Idaho, with U.S. 30N passing thru Pocatello, Idaho, and U.S. 30S passing through Ogden, Utah. Like many of the then-new U.S. routes that appeared in the 1926 Rand McNally Road Atlas, it is unlikely that U.S. 20 was ever signposted along today's U.S. 30 west to Astoria, Oregon. States did not necessarily place route markers immediately upon route designation, and in some states, the local automobile association was charged with signposting. Further, the 1926 Rand McNally Road Atlas shows unapproved U.S. routes. AASHO did not adopt the U.S. numbered highway system until November 11, 1926. The 1926 Rand McNally atlas used a draft of the U.S. numbering plan rather than the final approved version. The subsequent 1927 atlas showed numbering that matches the final approved plan. With the November 1926 plan, the western terminus of U.S. 20 was set at the east entrance to Yellowstone National Park, and U.S. 30 had its new western terminus of Astoria. U.S. 20 did not keep its western terminus at the western entrance of Yellowstone National Park. It was extended west to Albany, Oregon, in 1942. Notably, U.S. 20 was not designated through the park, so it has an official route gap (but some maps today show the implied route of U.S. 20 through the park via the southern portion of the Grand Loop Road via Old Faithful). In the 1950s, U.S. 20 was again extended west, this time from Albany to Newport, which makes the route transcontinental. The actual route of U.S. 20 in Idaho changed more that once between 1942 and the late 1960s. Originally, the route headed from the Park to Idaho Falls, along U.S. 91 to Blackfoot, northwest to Arco, to Carey, Shoshone, Bliss, Mountain Home, Boise, Caldwell, Parma, and on to Nyssa, Oregon. By the mid-1950s, a short cut heading straight west from Idaho Falls toward Arco had been completed. In 1950, U.S. 26 was extended west from Wyoming via Idaho to Oregon, with much of U.S. 20 and U.S. 26 sharing the same route thru southern Idaho. Also, by the 1950s, the portion of U.S. 20 from Carey via Shoshone and Bliss to Mountain Home had been re-labeled as Temporary U.S. 20. It wasn't until the 1970s, however, that U.S. 20 was routed more directly west from Carey via Fairfield to Mountain Home. The draft U.S. highway plan shown in the 1926 Rand McNally Road Atlas indicated no split route (north/south branches) definition for U.S. 30 in Southwestern Wyoming. Instead, draft plans called for U.S. 530 to connect U.S. 30 at Granger, Wyoming, with U.S. 91 near Pocatello, Idaho, via what is now U.S. 30. The draft plans called for U.S. 630 to connect U.S. 30 at Echo, Utah, with Ogden, Utah, via what is now Interstate 84. At that time, U.S. 30 was planned to end at U.S. 40 near Park City, Utah (this is now close to where U.S. 40 ends at its junction with Interstate 80). By 1927, the final plan changed to the split definition requested by Utah. U.S. 30S took mainline U.S. 30 and draft U.S. 630, while U.S. 30N took draft U.S. 530. 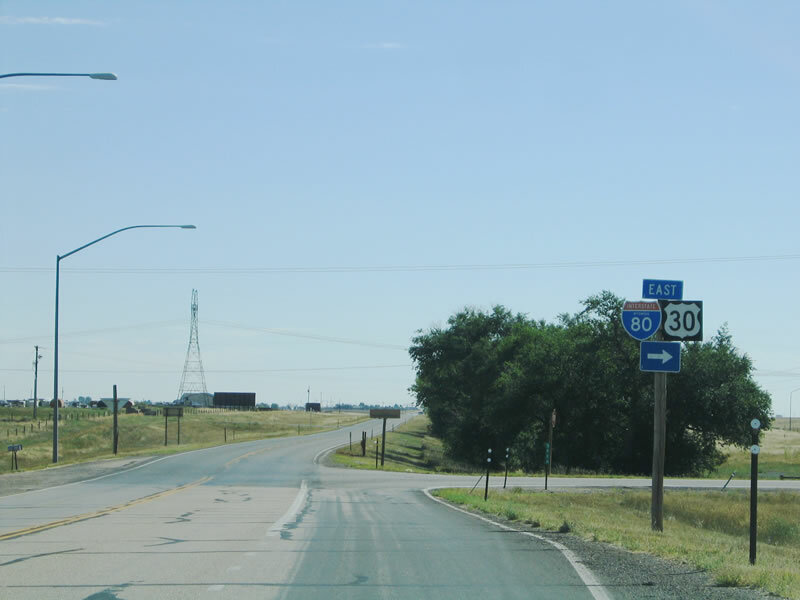 It is unlikely that U.S. 530 and 630 signs were ever erected in Wyoming as those plans changed to the U.S. 30N and U.S. 30S split. This allowed U.S. 30 to serve both Ogden, Utah, and Pocatello, Idaho vis the southern and northern branches, respectively. 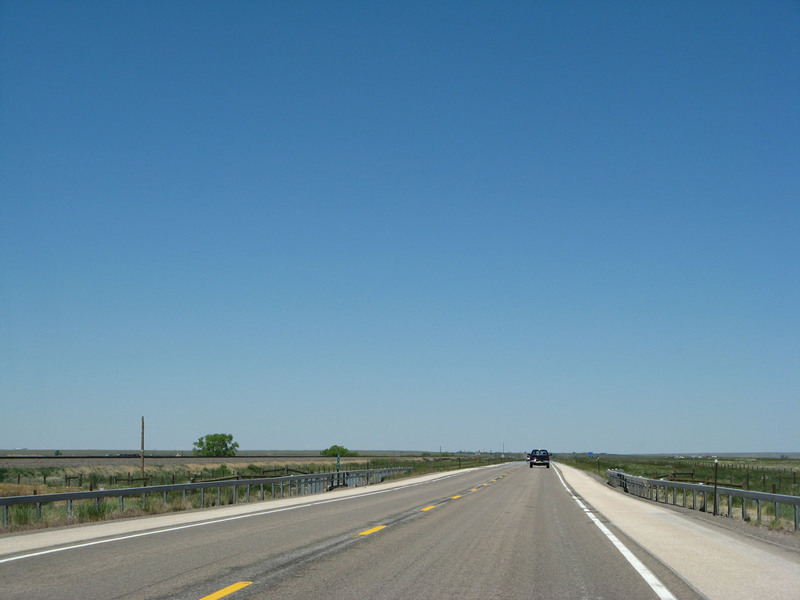 U.S. 530 and U.S. 630 were later used elsewhere in the U.S. highway system, but both of them are now gone. U.S. 530 was assigned to a 25-mile-long route that connected U.S. 30S near Echo Junction (where Interstate 80 and Interstate 84 currently meet) with U.S. 40 near Silver Creek Junction (where Interstate 80 and U.S. 40-189 currently meet). It was replaced by U.S. 189 and later by Interstate 80. 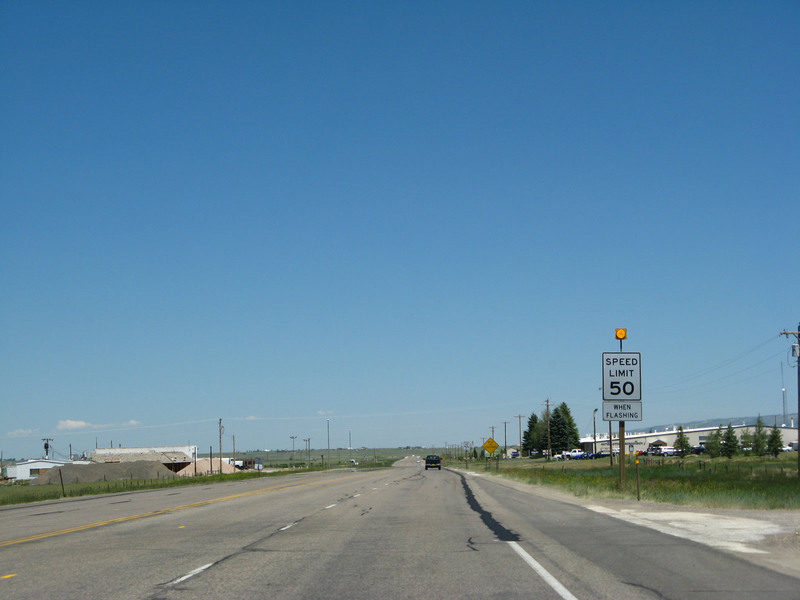 As for U.S. 630, it was assigned to a very short, two-mile route connecting U.S. 95 in Weiser, Idaho, with Former U.S. 30N (now Oregon 201) over the Snake River. This designation did not last and was replaced with Spur U.S. 95. Between 1926 and 1972, U.S. 30 retained the north-south split route in southwestern Wyoming. U.S. 30S began in Rupert, Idaho, and traveled southeast to the Utah towns of Tremonton, Ogden, and Echo (via today's Interstate 84). At Echo, U.S. 30S met old U.S. 530 (a short connector between U.S. 30S and U.S. 40 that is now overlaid by Interstate 80), and then U.S. 30S turned northeast to enter Wyoming at Evanston. U.S. 30S then continued through the Three Sisters area and Bridger Valley (Lyman, Mountain View, and Fort Bridger) to merge with U.S. 30N near Granger. U.S. 30N, on the other hand, kept well to the north of U.S. 30S. This route followed modern-day Interstate 86 east from Rupert to American Falls and Pocatello, then it turned southeast toward Kemmerer and Granger. Today, U.S. 30N is known as the mainline U.S. 30. In 1956, the Interstate Highway System Act was passed, leading to a new era of decreased importance for U.S. 30. The 1947 plan of Interstate Highways presented U.S. 30S and U.S. 30 as becoming part of a transcontinental interstate (today's Interstate 80) between San Francisco and New York. Wyoming and Idaho officials tried to get U.S. 30N admitted into the Interstate Highway System in 1957, but it was rejected. With the formal plan finalized in November 1926, U.S. 30 was officially designated as one of the first transcontinental highways -- running from Astoria, Oregon, east to Atlantic City, New Jersey. Through the history of the U.S. highway system, U.S. 30 is one of the few east-west, transcontinental U.S. routes that has not been truncated or reduced in length at all, unlike others such as U.S. 6, U.S. 40, U.S. 50, U.S. 60, U.S. 70, and U.S. 80. However, U.S. 30 shares pavement with Interstate 84 and Interstate 80 for significant portions in Oregon, Idaho, and Wyoming. As Interstate 80 was constructed through the 1960s and 1970s, U.S. 30 was slowly moved to the new freeway. All along the bypassed segments of U.S. 30 are abandoned road fragments and older service roads that may have at one time carried U.S. 30 but now are dirt or in states of decay. 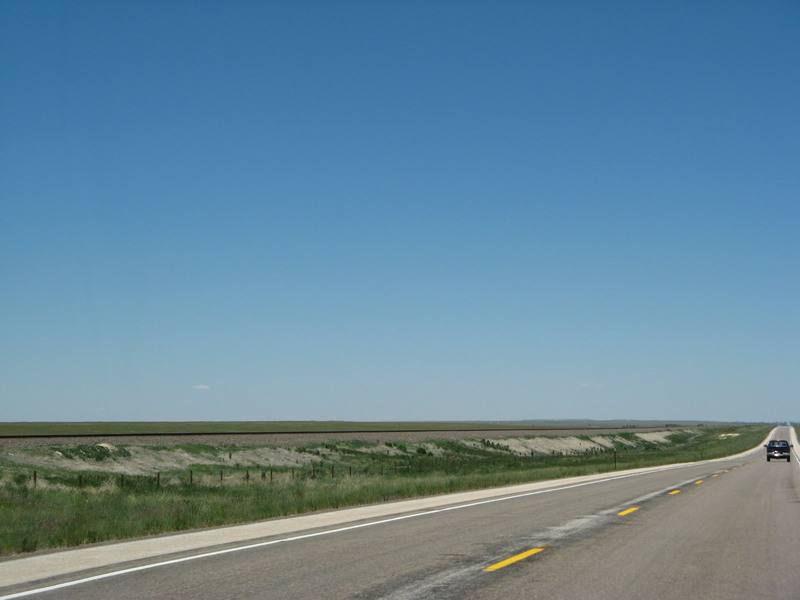 In some cases, the old alignment is maintained by the state as a service road, such as Wyoming 374 and Wyoming 76, as well as unmarked yet paved service roads found along Interstate 80. Today, U.S. 30 is one of the longest U.S. routes, alongside U.S. 20, U.S. 6 (U.S. 6 was the longest before most of its California segment was decommissioned), and U.S. 50. However, much of its western route has been absorbed by the Interstate Highway System. Through most of Oregon and Idaho, Interstate 84 has replaced U.S. 30. Surprisingly, both states have old sections of the original route designated as U.S. 30. 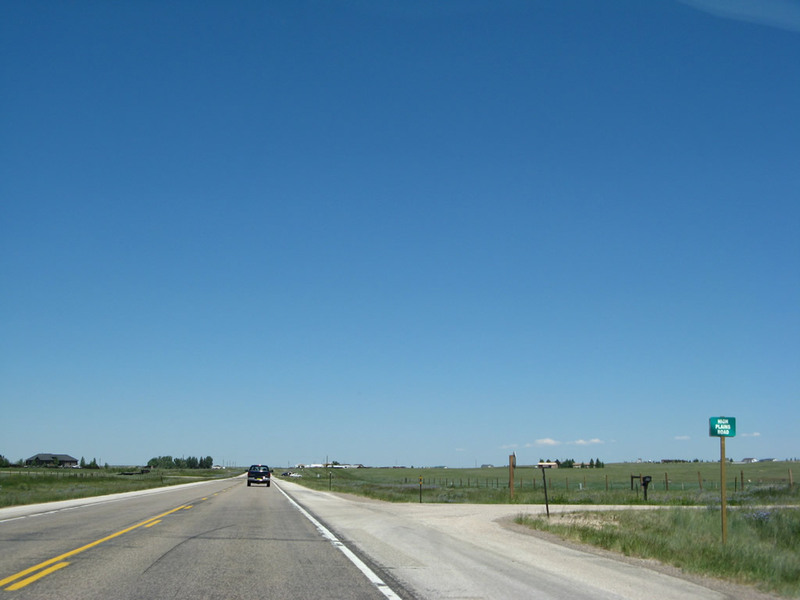 Unlike most other portions of Interstate 80, the segment between Walcott Junction and Laramie was not routed directly over U.S. 30. Instead of steering well north of the Snowy Range, highway planners decided the freeway would be better situated and more direct if aligned along the northern edge of the Snowy Range. Placing Interstate 80 onto this new alignment located well south of the older U.S. 30 alignment allowed U.S. 30 to remain on its alignment and not shift onto the new freeway. However, this action also sent Interstate 80 into high elevations with frequent wind and snow. Wyoming historian John Waggener notes numerous weather-related road closures due to the high wind and blowing snow along Interstate 80. With these weather-related closures on Interstate 80, U.S. 30 (and U.S. 287) provide a suitable alternate route via its more circuitous yet more-often-open route alongside the Union Pacific Railroad and Lincoln Highway from Walcott Junction through Medicine Bow to Laramie. With the construction of the Interstate highway across the southern tier of Wyoming, over 60% of U.S. 30 was absorbed by Interstate 80. Completion of Interstate 80 also resulted in elimination of U.S. 30S, which was replaced by the combination of Interstate 84, Interstate 15, and Interstate 80, while former U.S. 30N became the new U.S. 30. For photos, see Eastbound Interstate 80 Wyoming in Carbon County. 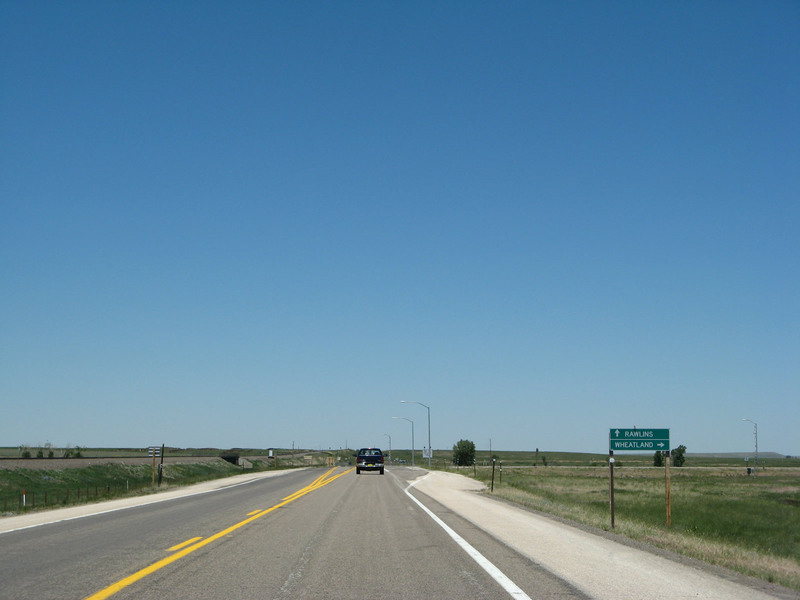 North of the Interstate 80 junction at Walcott, U.S. 30 east and U.S. 287 south follow the original route of the Lincoln Highway toward Hanna, Medicine Bow, Rock River, and Bosler before rejoining Interstate 80 at Laramie. 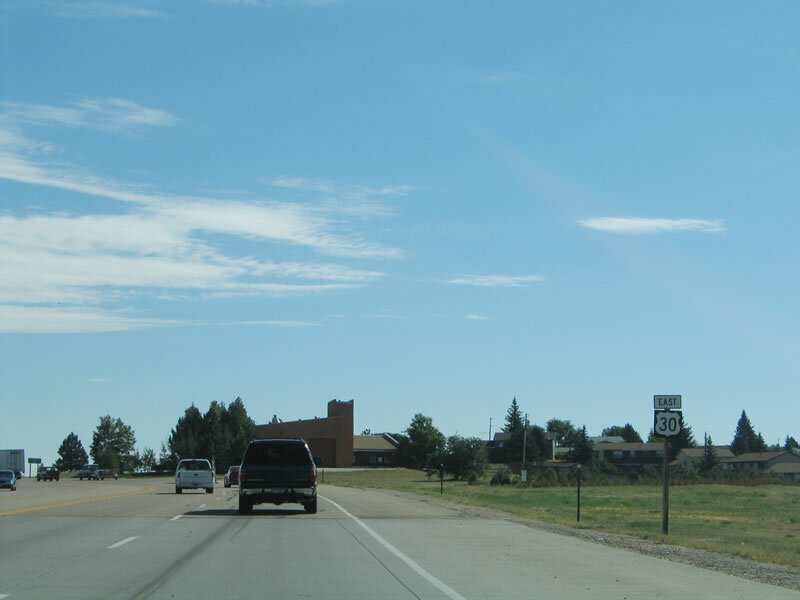 The Lincoln Highway followed a variety of alignments before adopting the current route of U.S. 30-287; Interstate 80 between Laramie and Walcott never was part of the official Lincoln Highway corridor across the country. Photo taken 09/06/05. For photos, see Business Loop Interstate 80 in Laramie. For photos, see Eastbound Interstate 80 Wyoming in Albany County and Eastbound Interstate 80 Wyoming in Laramie County. For photos, see Business Loop Interstate 80 in Cheyenne. 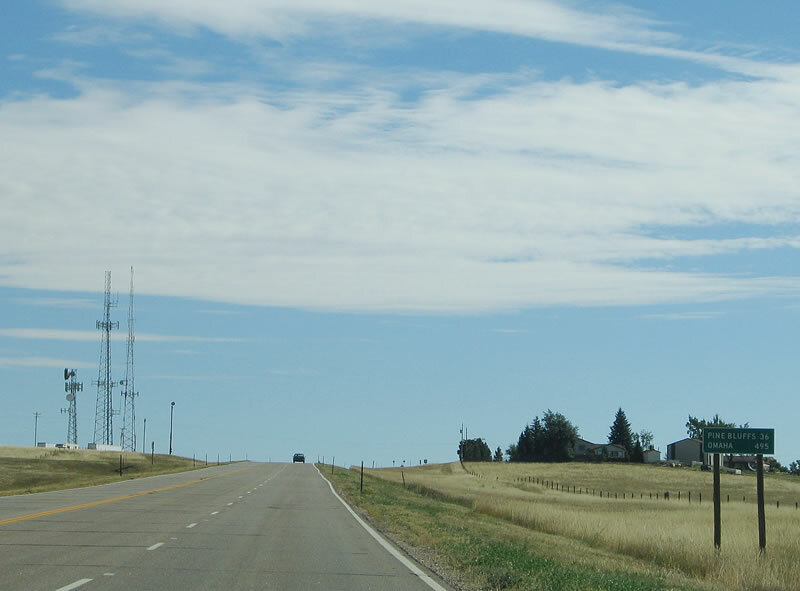 U.S. 30 continues east of Wyoming 212 (College Drive) as an extant route, following Lincolnway to Archer, where the US route will reconnect with Interstate 80. The stretch of U.S. 30 between Wyoming 212 and Interstate 80 is not cosigned with Business Loop I-80, despite some maps that misrepresent this. Photo taken 09/05/05. Eastbound U.S. 30 approaches Pershing Boulevard, a major east-west street that crosses the city of Cheyenne between Interstate 25 Exit 11 (near the Randall Avenue/F.E. Warren interchange) and passes the UMC and VA hospitals en route to this traffic signal. Pershing Boulevard is the first generation alignment of the Lincoln Highway; U.S. 30 is the second and newer generation of that historic road. Photo taken 09/05/05. After the Pershing Boulevard intersection, U.S. 30 widens out to four lanes with a median barrier. In some maps that date to the early 1960s, there may have been plans for Interstate 80 to follow Lincolnway from here east to Archer. However, the freeway was ultimately routed to the south on a new alignment, and U.S. 30 was left to remain on its original route. The divided highway remains as evidence of this earlier plan for Interstate 80. Photo taken 09/05/05. The divided highway lasts for nearly a mile, but it comes to an end as Lincolnway (U.S. 30) approaches Hayes Avenue. Photo taken 09/05/05. Now a two-lane highway, Lincolnway (U.S. 30) approaches Whitney Road. Photo taken 09/05/05. This mileage sign provides the distance to Pine Bluffs (at the state line between Wyoming and Nebraska) and Omaha, some 495 miles distant from here via U.S. 30 and Interstate 80. Photo taken 09/05/05. As Lincolnway continues to travel in a northwesterly direction, it intersects another major east-west roadway: Dell Range Boulevard. Dell Range extends west from here to a major commercial corridor, where many "big box" stores and the local mall can be found. Dell Range skirts the north edge of Cheyenne Airport before ending at Wyoming 219 (Yellowstone Road, which is former U.S. 85-87; before 1936, what is now Wyoming 219 was then U.S. 185). Photo taken 09/05/05. A few miles further east, U.S. 30/Lincolnway approaches its junction with Interstate 80. 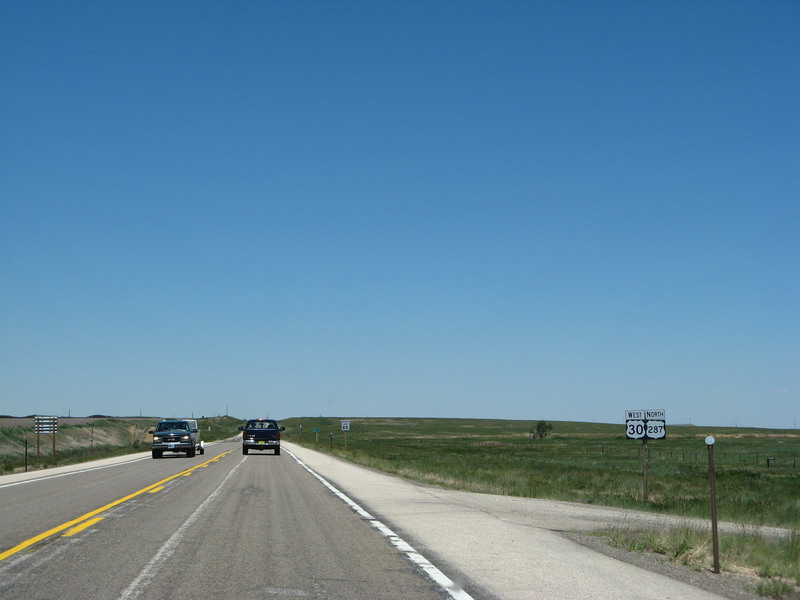 Use Interstate 80 west to return to Cheyenne; follow Interstate 80 east to continue east on signed U.S. 30. A service road on the north side of the freeway will continue as the old alignment of U.S. 30 Photo taken 09/05/05. After crossing the Union Pacific Railroad viaduct, U.S. 30 approaches the connection to Interstate 80. Rather than intersect the freeway directly, motorists must turn right (south) onto the connector road to join Interstate 80. The service road continues straight ahead. Photo taken 09/05/05. Eastbound U.S. 30 turns right onto the connector road. The third generation of Lincoln Highway follows the service road, while the original alignment of the Lincoln Highway veers away from Interstate 80, following the Union Pacific Railroad northeast toward Burns and Egbert before rejoining Interstate 80 and U.S. 30 at Pine Bluffs. While sections are paved, substantial sections of this original Lincoln Highway alignment are not paved. Photo taken 09/05/05. The connector road between the Lincoln Highway and Interstate 80 intersects at a diamond interchange. U.S. 30 merges onto Interstate 80 east. Photo taken 09/05/05. For photos, see Eastbound Interstate 80 Wyoming in Laramie County. For photos, see Westbound Interstate 80 Wyoming in Laramie County. For photos, see Westbound Interstate 80 Wyoming in Laramie County and Westbound Interstate 80 Wyoming in Albany County. 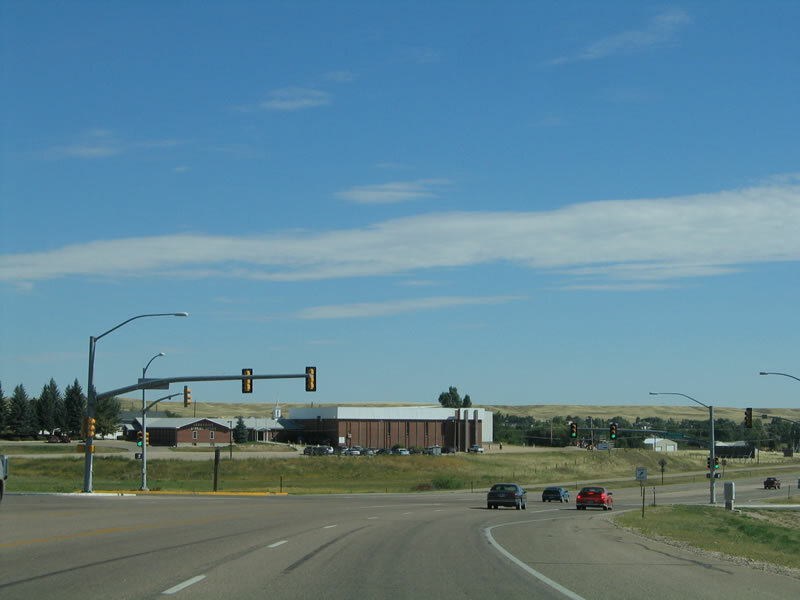 Westbound U.S. 30 and northbound U.S. 287 leave Laramie along Third Street and proceed as a five-lane highway en route to Bosler. Photo taken 06/30/08. 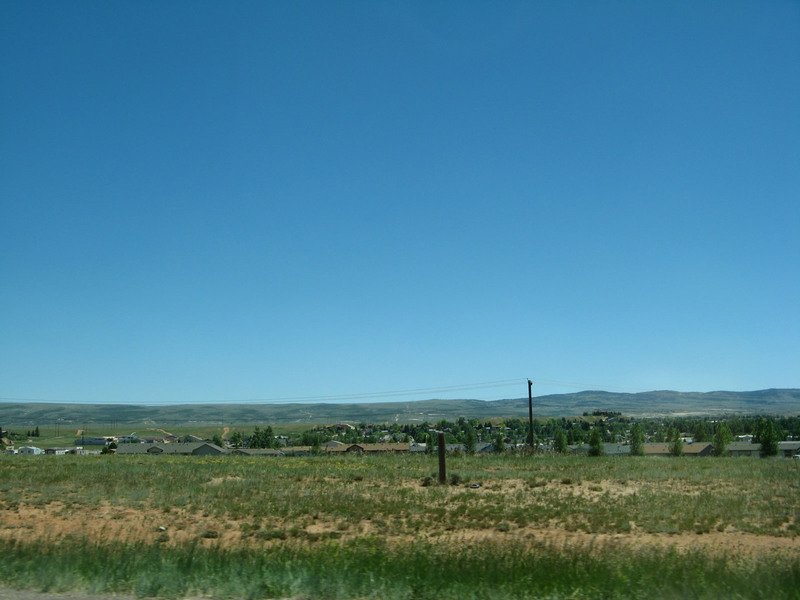 This view looks east from U.S. 30 and U.S. 287 toward the northern edge of developed areas of Laramie and toward the Laramie Mountains. Photo taken 06/30/08. Power lines cross over U.S. 30 and U.S. 287. Photo taken 06/30/08. 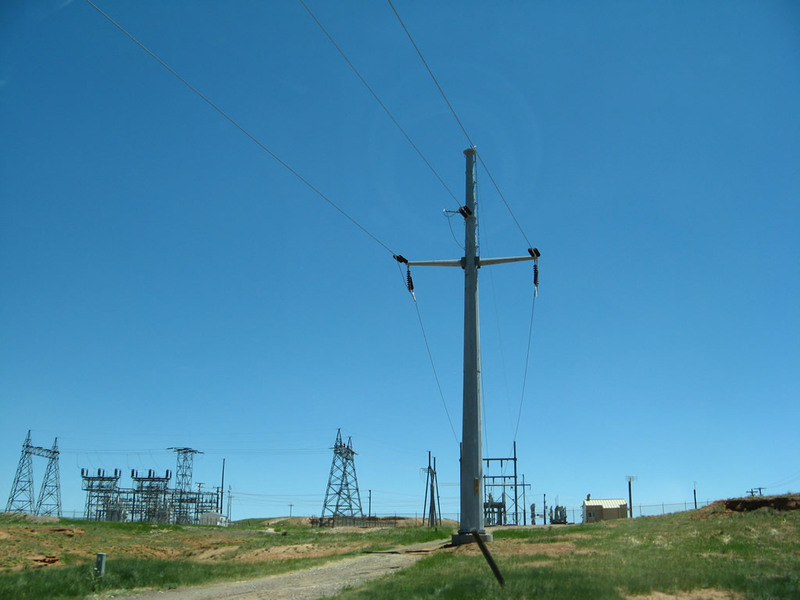 Those power lines lead into a small substation on the east side of U.S. 30 and U.S. 287/Third Street north of Laramie. Photo taken 06/30/08. 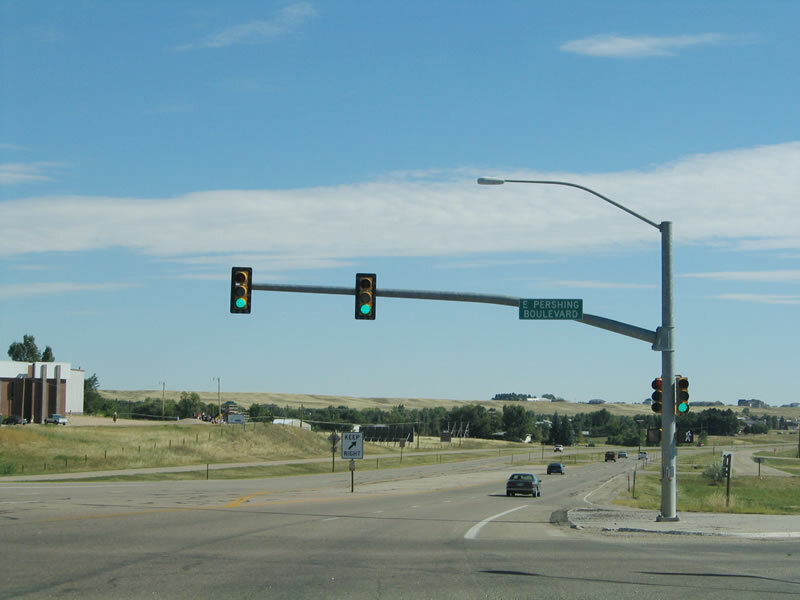 U.S. 30 and U.S. 287 retains four lanes as it leaves the urban area of Laramie and enters an industrial strip north of town. Photo taken 06/30/08. A white regulatory sign advises motorists that U.S. 30 and U.S. 287 are closed 17 miles ahead when the lights are flashing. Usually these lights illuminate during severe inclement weather. Photo taken 06/30/08. The speed limit increases to 50 miles per hour. What's odd is that this speed limit is only in effect when the light above the sign is flashing, which it was doing when we passed through the area. It's more common to see this sort of sign assembly for a school zone. Photo taken 06/30/08. 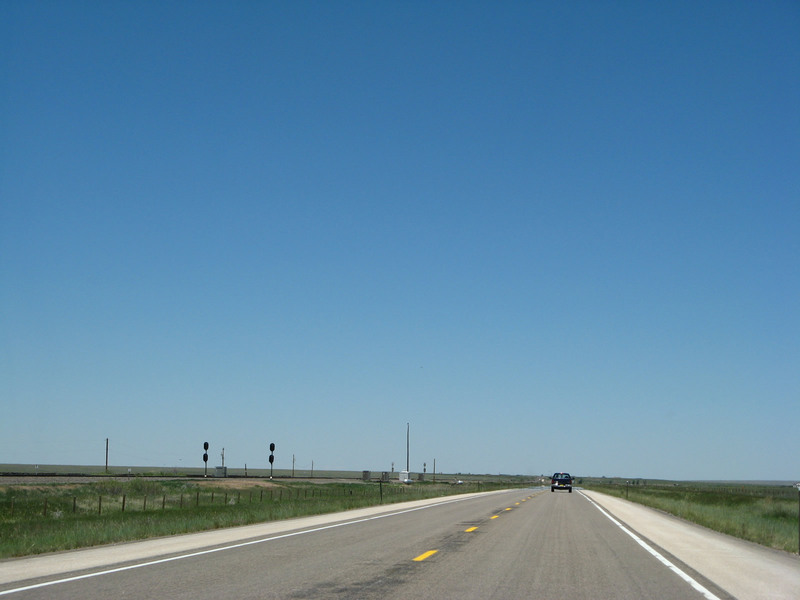 The speed limit along U.S. 30 and U.S. 287 increases to 65 miles per hour, and the right lane ends. The four-lane highway will reduce to a two-lane highway. 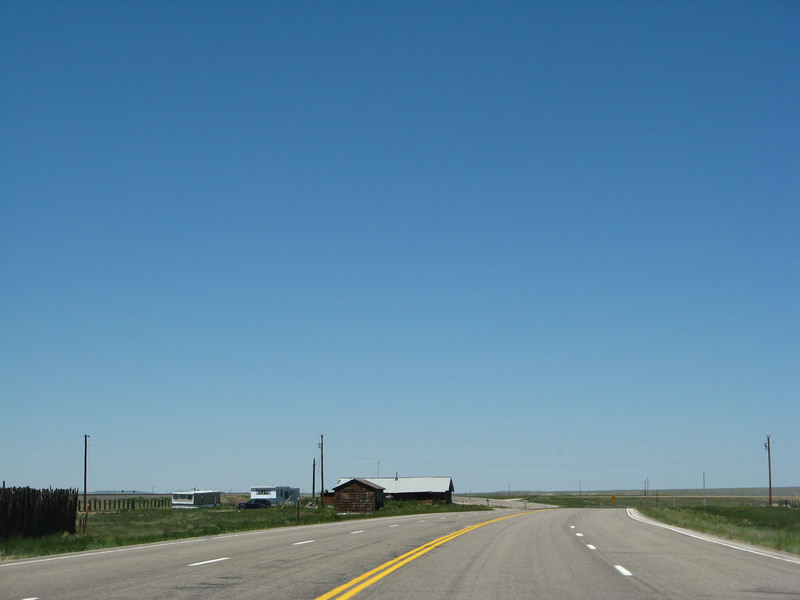 Most roadside businesses start to dissipate, and U.S. 30 and U.S. 287 enter rural, undeveloped areas on the drive between Laramie and Bosler. Photo taken 06/30/08. 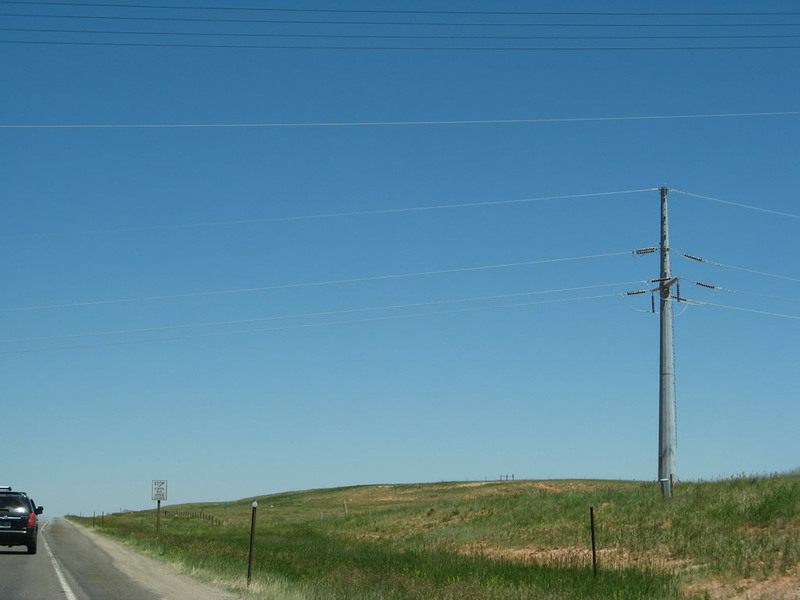 A single-circuit power line passes over U.S. 30-287. Photo taken 06/30/08. 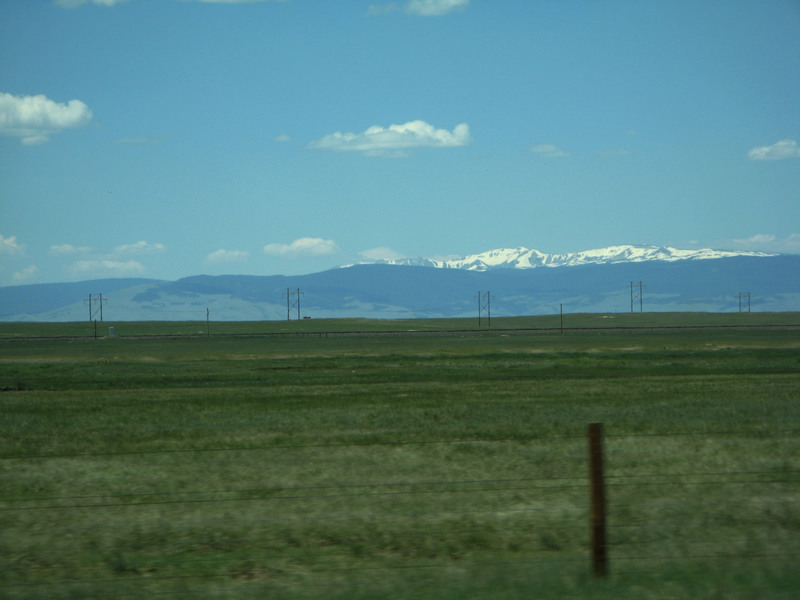 Even in early summer and late June, snow is plainly visible from U.S. 30-287 on the peaks of the Snowy Range, which is more formally known as Medicine Bow Mountains. Wyoming 130/Snowy Range Road travels west into and over the mountain range between Laramie and Saratoga. Photo taken 06/30/08. 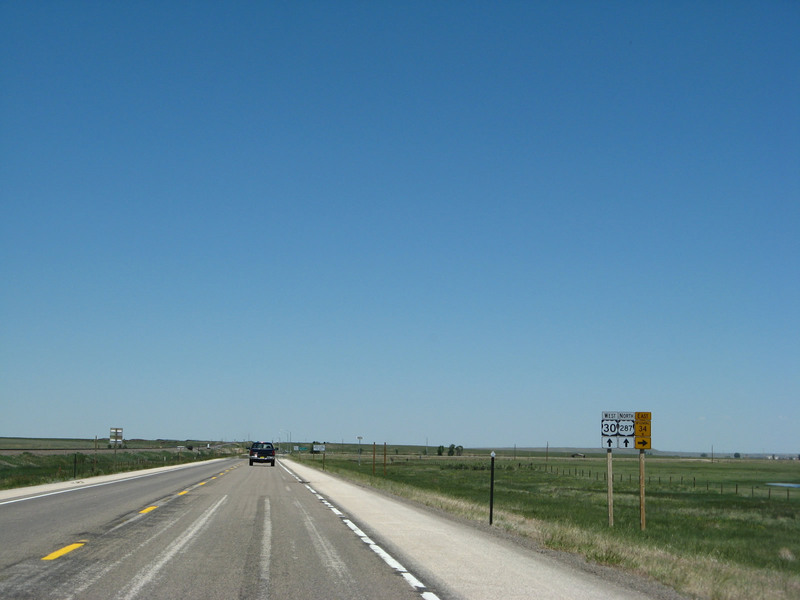 Westbound U.S. 30 and northbound U.S. 287 meet High Plains Road north of Laramie. Photo taken 06/30/08. 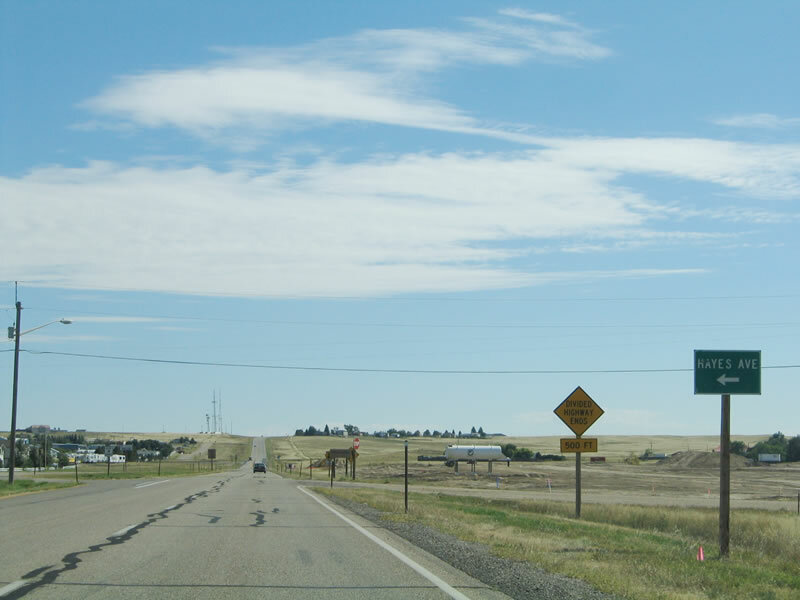 The aforementioned closure point for U.S. 30 and U.S. 287 is located about 17 miles north of Laramie. Signage and a gate advise motorists of where to stop. Photo taken 06/30/08. To the east of U.S. 30-287 lie the snowless Laramie Mountains. These mountains have ample snow during the winter. Photo taken 06/30/08. Traveling north along U.S. 30-287, we follow the Union Pacific Railroad and stay close to the Laramie Mountains while chasing the Laramie River. The highway is lightly traveled as compared to Interstate 80, but the winter weather conditions along this route tend to be milder due to the distance the highway keeps away from the Snowy Range. Photos taken 06/30/08. 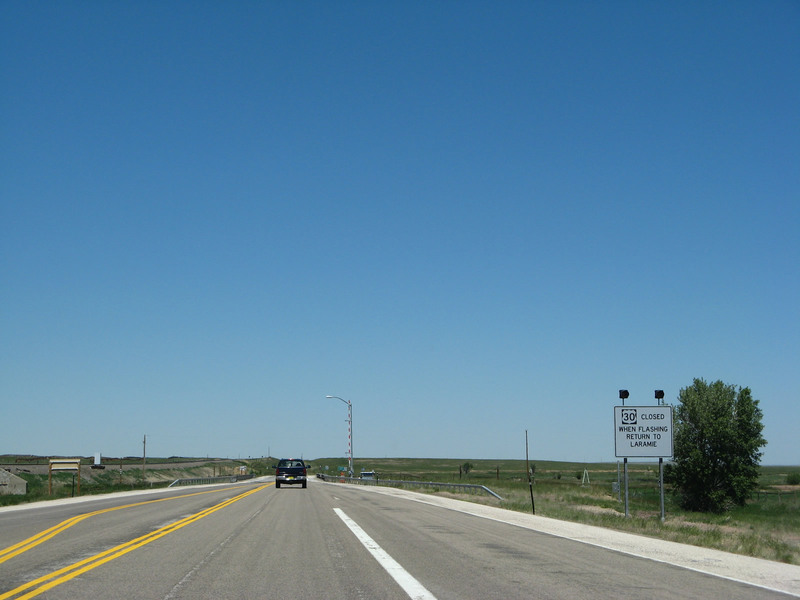 Westbound U.S. 30 and northbound U.S. 287 approach the junction with Wyoming 34 east to Interstate 25 and the city of Wheatland, about 55 miles northeast of here. This scenic highway travels through Sybille Canyon and over Morton Pass in the Laramie Mountains. Photo taken 06/30/08. 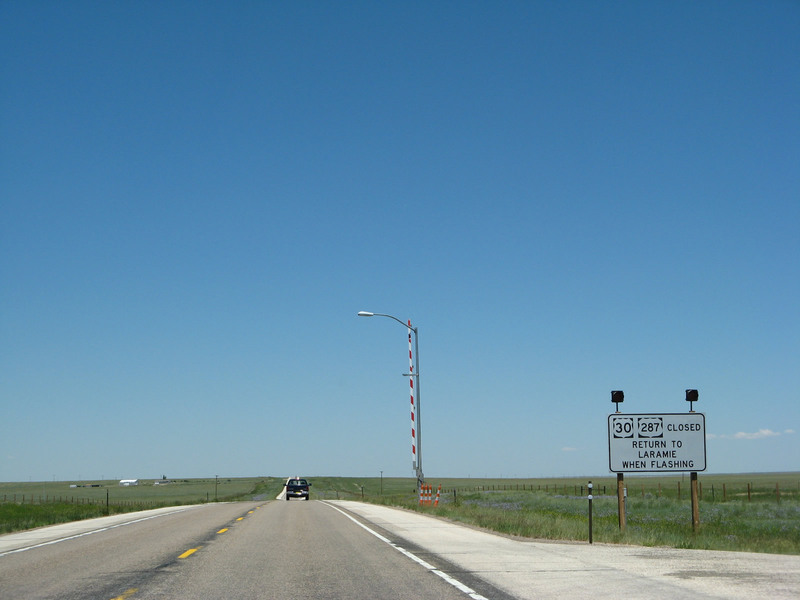 Continue ahead on westbound U.S. 30 and northbound U.S. 287 to Medicine Bow and Rawlins or turn right for Wyoming 34 east to Wheatland. 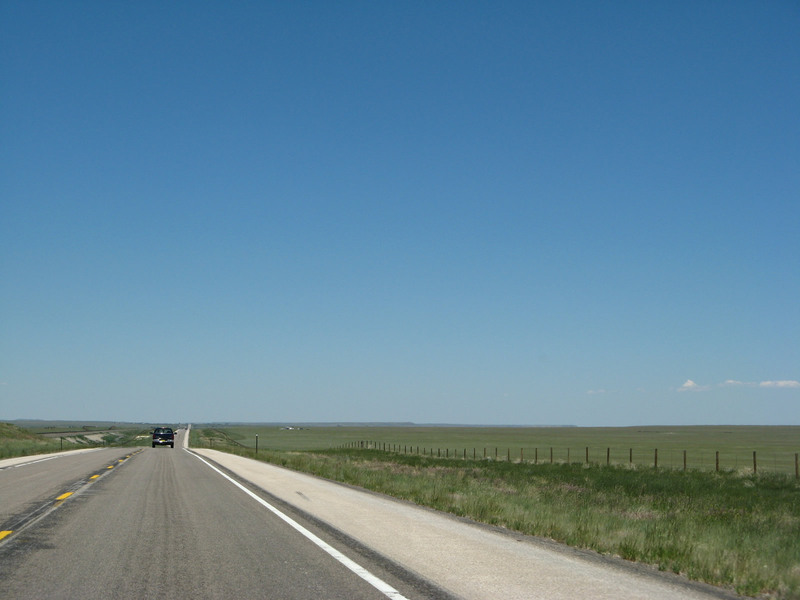 A 52.38-mile route, Wyoming 34 travels from U.S. 30-287 near Bosler northeast to Interstate 25 and U.S. 87 near Wheatland. Photo taken 06/30/08. Another gate closure (activated during inclement weather) is located along westbound U.S. 30 and northbound U.S. 287 after the junction with Wyoming 34. Photo taken 06/30/08. The Laramie River, which has generally followed U.S. 30-287 from Laramie north to this point, crosses the highway and continues north toward the Wheatland reservoirs, then curves east to pass through the Laramie Mountains en route to an eventual rendezvous with the North Platte River. Photo taken 06/30/08. A U.S. 30 and U.S. 287 reassurance shield assembly. Photo taken 06/30/08. This mileage sign provides the distance to Rock River (21 miles) and Rawlins (96 miles); the brown sign identifies U.S. 30-287 as part of the Sand Creek Massacre Trail. Photo taken 06/30/08. 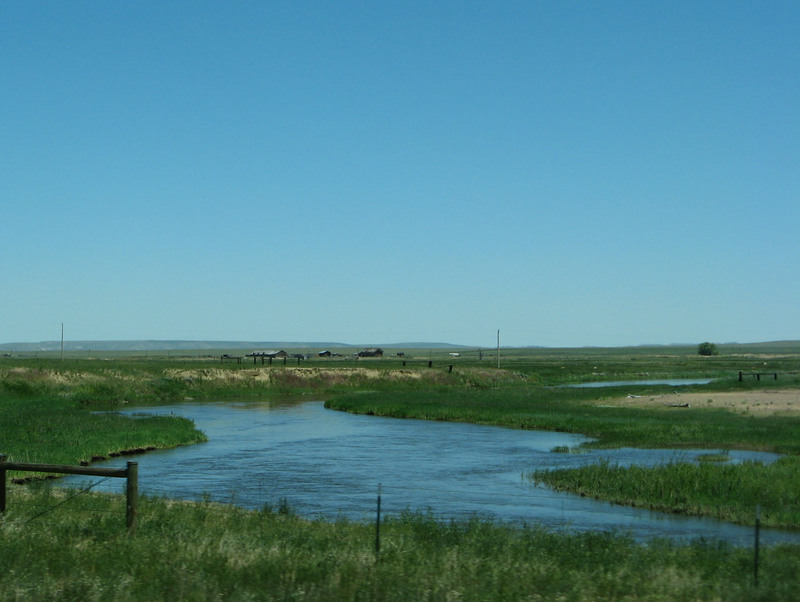 The Laramie River flows northeast toward the Laramie Mountains as part of the North Platte River watershed. Photo taken 06/30/08. U.S. 30-287 widens as the highway enters the unincorporated community of Bosler, which sits at an elevation of 7,080 feet above sea level and has a post office despite its small size. 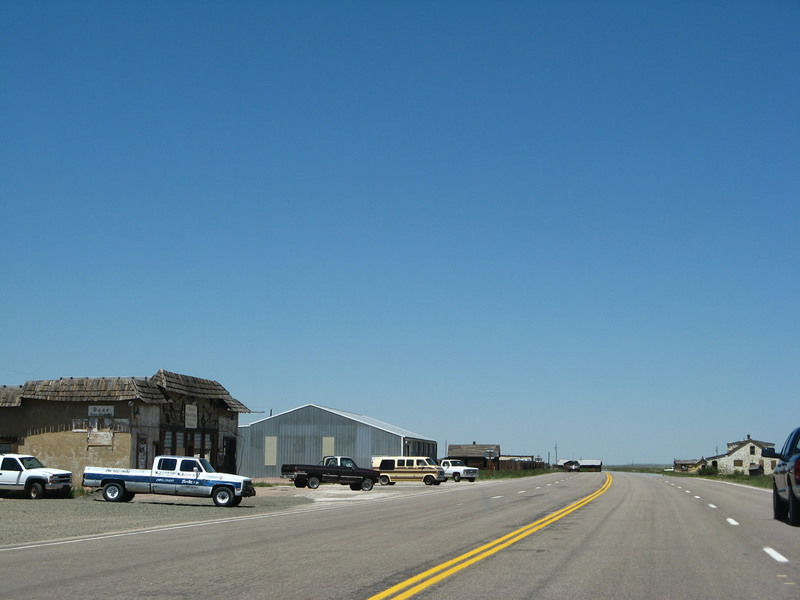 Some consider Bosler to be a ghost town given several vacant buildings along the highway; it was busiest in the days before Interstate 80 was constructed. Look on the left side of the highway for Doc's Western Village. Photos taken 06/30/08. 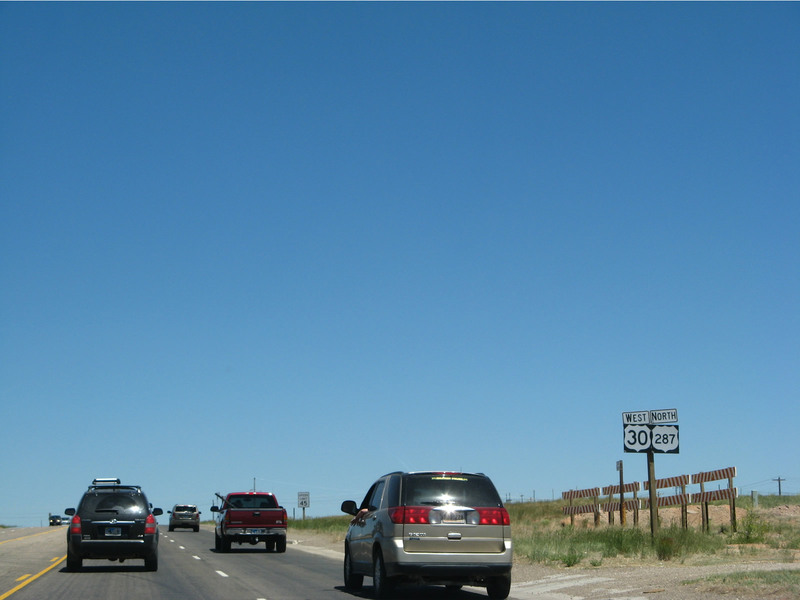 Skipping ahead, westbound U.S. 30 and northbound U.S. 287 meet Interstate 80 and Wyoming 130-230 at Walcott Junction. 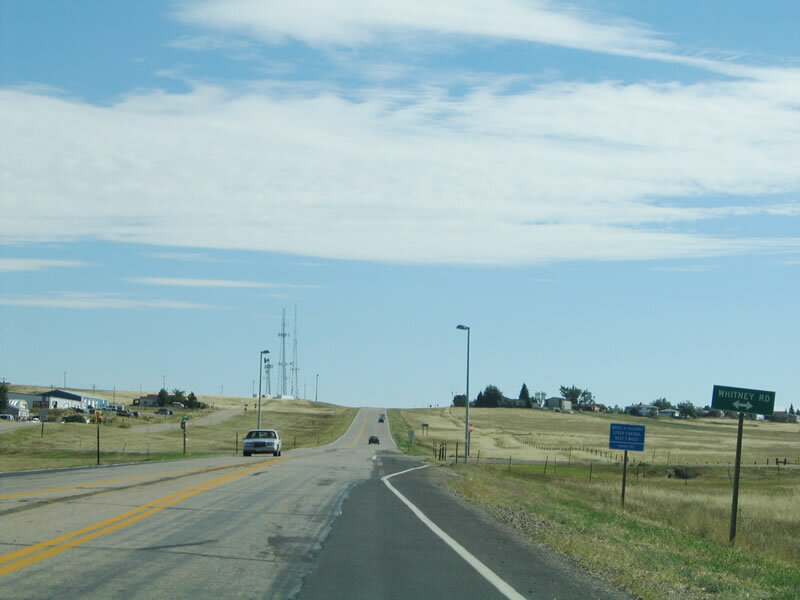 Follow Interstate 80 east to Elk Mountain, Arlington, and Laramie; follow Interstate 80 west to continue along U.S. 30-287 west to Rawlins. Straight ahead, Wyoming 130 and Wyoming 230 proceed south toward Saratoga. South of Saratoga, Wyoming 130 curves east to Laramie, and Wyoming 230 proceeds south to Encampment and crosses into Colorado where it becomes Colorado 125 en route to Three Way. Photo taken 09/07/05. 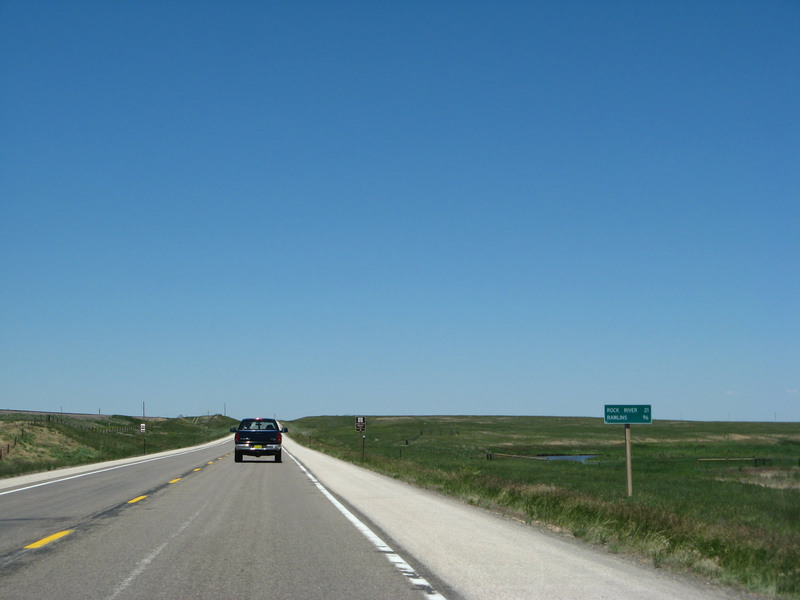 For photos, see Westbound Interstate 80 Wyoming in Carbon County, Westbound Interstate 80 Wyoming in Sweetwater County (#1), and Westbound Interstate 80 Wyoming in Sweetwater County (#2). Between Rock River and Bosler, U.S. 30-287 becomes a freeway, with access control for a 17-mile stretch between these two towns. There are no interchanges along this portion of highway. This freeway was constructed with the intent that it would become part of Interstate 80, but that idea was abandoned once the new stretch was built closer to Arlington and Elk Mountain. 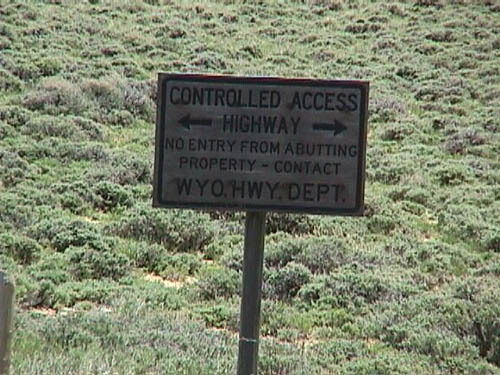 Along this stretch, signs such as this one are posted along the right-of-way to indicate the fact that this is an access-controlled facility. Photo taken by Michael Ballard, 08/98. Page Updated September 11, 2016.